On August 31, 1999, Adobe announced the immediate shipping of the very first commercially-available version of InDesign. The question ten years ago was not so much, “is it better than QuarkXPress” so much as “does it have a chance of unseating an entrenched page layout standard?” What a difference ten years make. I first saw an Adobe demo of the yet-to-be-released InDesign 1.0 at the HOW Design Conference in Dallas in June of 1999, a few months before its release. I wasn’t looking to switch, didn’t have the budget for it personally or at my job, and didn’t really believe that it was possible to steer the page layout software industry in a new direction. But I was intrigued. I saw a respect for typography that had been missing on the desktop for the past ten years. I saw some innovative features, and an elegant interface and toolset that reminded me of PageMaker, which I had long ago been forced to give up because of the industry-wide shift to QuarkXPress. But I hoped—really, sincerely hoped—that it would succeed. I didn’t start dabbling with InDesign until version 2.0, and didn’t start using it in earnest until InDesign CS, at which point, I turned my back on the old regime forever. Since then, InDesign has quite literally changed my life. That’s not something you can say about most software, but it’s entirely true in my case. InDesign has transformed how I work every day, and how I approach my work. My passion for the product has also taught me a lot about myself. Since embracing it and learning all I could, I looked for a way to share that knowledge and that transformation with my fellow designers. That resulted in The InDesigner podcast, which opened the door to magazine articles, seminar workshops, teaching assignments, consulting work, a book, and more exciting projects on the horizon. My personal association with InDesign has not only made my working life easier, it has broadened my professional life in amazing ways. I have become connected to a global community of fellow designers and many other brilliant software experts. I’ve learned as much, if not more, about myself as much as I have about techniques, features and workflows. So, today—on InDesign’s 10th birthday—I’d like to thank all of those Adobe engineers, designers, type experts, product managers, and anyone else who had a hand in bringing this product into the world, as well as to all of those who’ve shepherded it along into healthy maturity in the ten years since. My story—and I’m sure that of many others—is likely an end-result of their efforts that was never anticipated. Raise a glass…pat yourself on the back…however you reward yourself: you’ve earned it. 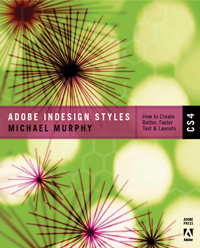 UPDATE: The bug detailed below has been fixed in the 6.0.4 update of Adobe InDesign, released 22-Sept-2009. See details in this related post. If you haven’t already noticed, a very useful feature that’s been around since InDesign CS has been broken in InDesign CS4. I noticed myself when preparing for a recent seminar in Washington, D.C. After creating a Style Mapping preset from the Microsoft Word Import Options dialog, I opened a template and tried to import a Word file using that preset only to find that none of the 20 or so style associations I’d just made had been preserved in the preset. While the preset name was available from the preset menu at the top of the dialog, none of the settings associated with that preset were preserved. With Facebook and Twitter all the rage these days, I’ve finally thrown my hat into the social networking arena (kicking and screaming, and later than everyone else, as ususal). Actually, it’s more like a toe in the water. I’m still grappling with the real value of these networks, but I’m starting to use them as ways to update fans of the podcast and my book in a more immediate way than the blog does. Of course, the blog will continue, and the podcasts are starting up again very soon, but this is one more channel to provide quick updates for those interested. You can follow me on Twitter, or join my Facebook fan pages for the book and the podcast. My status updates and tweets on these networks will include information about upcoming classes, seminars, projects (and there are some good ones coming up!) and conferences, but I won’t clog your mobile phones with mundane details like what I’m watching on TV. For now, at least, I’m keeping it strictly business. If you dare–and if you care–follow along!